DO YOU WANT YOUR GIFT TO MAKE THE MOST LASTING IMPRESSION EVER? Dulcet is the answer - the perfect gift you just can't go wrong with! The essence of perfection, a traditional chewy brownie combined with freshly ground walnuts, so good! Made with delicious chunks of semi-sweet chocolate; rich look, flavor and taste. Buttery and moist, these peanut cookies are heavy in flavor and bursting in each bite. Ultra this, soft, classic and scrumptious chocolate chip cookies! Simply the most decadent rugelach you have ever tasted! One bite and you'll be hooked! Quality, Service and value are truly our most important ingredient and we're sure you'll agree every time you order from us! Quality & presentation is our top priority. Each package is completely self-designed by Dulcet to mark its brand goals and high expectations; that is the reason why our customers keep buying us again and again! Satisfaction guaranteed, buy us with confidence! ASSORTED DELECTABLES - Dulcet Assorted Kraft Box includes: 2 Chocolate Chip Cookies, 2 Peanut Butter Cookies, 1/4 lb. 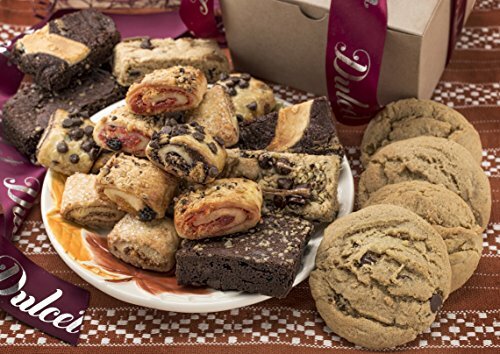 Assorted Rugelach, and 1/2 lb. Assorted Brownies of Chocolate Cheese, Blondie, and Walnut Brownies. DULCET SPECIALTY: Dulcet products are baked to perfection using only the finest ingredients to create a delightful taste sensation and one-of-a-kind gift. The combination of our beautifully presented boxes and the scrumptious treats inside makes us so popular in the world of gifts. GUARANTEED QUALITY & FRESHNESS - Our goal is to bring you the very best in quality and design. Each Dulcet pastry is baked to perfection using only high quality ingredients. Each item is individually wrapped to ensure freshness to the last bite. SATISFACTION GUARANTEED - We love our products, and we're sure you will to, but if you're not completely satisfied we'll be there for you - buy us with confidence! If you have any questions about this product by Dulcet Gift Baskets, contact us by completing and submitting the form below. If you are looking for a specif part number, please include it with your message.